Are you listening? Since the heat index is like a bazillion degrees right now, we thought we’d cool your thoughts with the introduction of a new item we have coming in for Christmas. Introducing ELF MAGIC! This fun family tradition has been around for decades. How does it work? The Elf Magic Elves , recognized by a magic snowflake placed on their heart by Santa himself , make the holiday season come alive with a timeless tradition that artfully blends playtime, the importance of family values, and reinforces the true meaning of Christmas. From discovering an Elf’s magical arrival in the home, to searching for their hidden Elf after a night full of adventures or Elfcapades™ – children know the magic in Elf Magic is real! What do we like about this elf? Children can play with him during the day and take him wherever they go. He is a friendly elf who is only there to make your Holiday season more enjoyable! 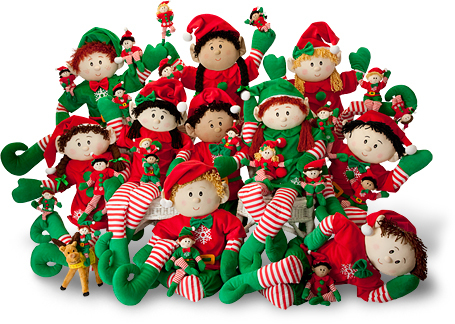 Each elf comes with a heartfelt poem about why they are visiting that child. As in true lexpblogger fashion, we have a cool video for your entertainment purposes. Apparently Elves don’t eat as many cookies as Santa, they prefer saltine crackers. 🙂 Enjoy and we’ll see you soon!